Download this referral form to refer a patient to us. Email this form to info@mapleplacedental.com or print it out and drop it off at our clinic. Thank you for your referral! We’re so proud to have sponsored the Conquistadors of Cancer for the Ride to Conquer Cancer. Together, they have raised $32,619.95 towards cancer research! Check out their pictures from the event below. Recently, our staff had a posture perfect lunch and learn that included an elevation chair, medicine ball and active lunch. It was great exercise and fun with the ladies of Maple Place and trainer, Sonia. Check out our pictures from the event below! How Do I Stop My Teeth from Getting Loose? People only get one set of permanent teeth during their lifetime, making it especially important to take care of them properly so that you can stop teeth from getting loose. 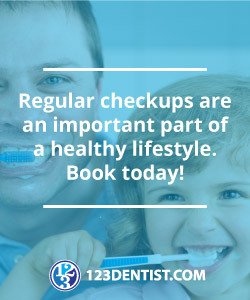 Unfortunately, even when you try to maintain good oral health, it is possible to experience unseen problems that eventually lead to decay or gum disease. Each of these conditions can eventually cause teeth to become loose. If you want to stop your teeth from becoming loose in your gums to prevent them from falling out of your mouth, you can follow the following valuable tips. Brushing your teeth is important for more than just keeping them clean and removing food debris since it can also help stop teeth from getting loose. If you brush your teeth regularly, you can help to remove plaque buildup. It is this plaque that is responsible for causing gum disease and decay, both of which can make your teeth weak and cause them to fall out of your mouth if left untreated. If you want to help stop teeth from getting loose in the first place, you should brush your teeth with toothpaste twice a day to help prevent plaque from developing and destroying your gums and teeth. Simply brushing your teeth twice a day isn’t always enough to prevent dental problems from occurring. Part of the reason for this is that your toothbrush can’t reach in between your teeth in order to remove food debris and plaque. Therefore, you need to floss on a daily basis if you want to stop teeth from getting loose because your gums are inflamed, swollen, and diseased. Brushing and flossing your teeth are great ways to help create a healthy mouth. If you also use an antibacterial mouthwash or rinse at least once a day, you can kill the germs that also lead to problems in the mouth. While rinsing with mouthwash can’t stop teeth from getting loose on its own, it is an important part of the overall strategy that you should take. Did you know that in Maple Ridge we recycle over 55% of our residential waist? The national Canadian average is only 20%, but Maple Ridge and Metro Vancouver hope to raise the level of recycled waist to over 80% by the year 2020. There are a number of ways you can contribute to a green, beautiful Maple Ridge, including being mindful of what products you buy and avoiding non-recyclable products whenever possible. Take a look at our list of some other ways to get involved in our environment. Hands down the most important link on our list, the Ridge Meadows Recycling Society manages door to door recycling, personal composting and commercial recycling for Maple Ridge and Pitt Meadows. The society is non-profit and offers a Recycling Depot for anyone not easily accessible on a pick-up route. Beyond maintenance and enforcement, the society offers a wide array of online resources, like tips and instructions on what to recycle and how. If you haven’t already, visit their site and consider becoming an active member. With the partnership of the Ridge Meadows Recycling Society, this city of Maple Ridge program offers staff at participating offices the chance to recycle more of their garbage and keep it out of the dump. Electronics, beverage containers, batteries and more can be recycled. Food garbage can be composted with special bins made by students at Pitt Meadows Senior Secondary. The bings are made with local cedar and look and smell great. Compost is mixed with soil and used in flower beds at the Memorial Peace Park. Contact the city of Maple Ridge or the Ridge Meadows Recycling Society to get involved! Another great local program for your office is offered by Climate Smart, and it encourages businesses to reduce their carbon emissions and save money in the process. To get your office enrolled, visit the link to learn about how the program works and get registered! Adopt-a-block is a society that encourages citizens and businesses to take responsibility for litter in Maple Ridge and surrounding areas. Adopting a block of land for a fee provides funds to the organization to control and prevent littering on our streets, not to mention public education to reduce future littering. You can learn more about the Adopt-A-Block Society through emailing them or by calling 604-463-9699. Support a clean Maple Ridge and show your city pride! The district of Maple Ridge and the Ridge Meadows Recycling Society have partnered to offer residents in certain areas a rebate for contributing to recycling and composting materials while improving the look of your neighborhood. For more information on the program, take a look at the link above. There are specific deadlines for residents in select neighbourhoods this April, so make sure you get to trimming before it’s too late! If you qualify for it, the district of Maple Ridge and the Ridge Meadows Recycling Society will offer you a $50 utility tax credit for switching to a low-flow toilet. Saving water is a great way to reduce costs at home and help the environment, so everybody wins! Another municipal partnership with the Ridge Meadows Recycling Society allows residents the opportunity to reduce waste in the home by 20% or more. Solar Cone Food Digesters are garden units that use solar heat and bacteria to reduce food waste by breaking it down to natural components. Kind of like a digestive system for compost. Learn more about this program and order a solar cone from the Ridge Meadows Recycling Depot. Visiting the family dentist has changed a lot over the years. Today’s dental professionals are equipped with modern equipment that assists them in delivering better services to their patients. This is true even for the identification of cavities. While many general and family dentists still rely on dental picks and x-rays to find cavities in their patients’ teeth, others take advantage of modern tools. Among these tools is a piece of equipment known as DIAGNOdent. It catches cavities early while they are still small and insignificant. Thanks to this technological marvel, DIAGNOdent catches cavities in their earliest stages, identifying decay when it is just beginning. DIAGNOdent Catches Cavities Early, But How Does It Do It? This desktop device uses a specialized laser to identify decayed areas of a tooth. When the light shines onto the tooth, the decayed portions fluoresce. The device is able to measure the amount of fluorescence that occurs in order to show just how much decay exists. Since DIAGNOdent catches cavities early while they are small, it makes it easier for the dentist to treat them. Designed to identify subsurface decay, DIAGNOdent catches cavities at a stage when they have not yet compromised the entirety of the teeth despite the fact that decay has started. This enables your dentist to repair the existing damage, while keeping as much of your tooth intact as possible. With traditional methods, cavities are not visible until they have done considerable damage to the teeth. As a result, the fillings that are needed are much larger than they would be using a diagnostic tool such as the DIAGNOdent, which catches cavities at such an early state that the damage is minimal. Bad breath is a very common affliction, but it is not very well understood. Dentists see patients with a wide range of causes for their bad breath, and it is important to be aware of certain key facts if you want to avoid developing bad breath (or are wondering how to improve your breath right now). Most cases of bad breath are caused by chronically bad dental hygiene, which leads to a build-up of bacteria in your mouth. As a result, brushing your teeth twice a day (and using the right technique) can go a long way towards ensuring that you will have fresh breath. If you have recently noticed bad breath, thinking about how you approach brushing your teeth is a very good first step. In addition to brushing your teeth, using a mouthwash that is antibacterial and contains an ingredient called cetylpyridinium chloride can help to reduce your chances of bad breath. A large percentage of other cases of bad breath are caused by smoking. If you are a smoker, you are not only more likely to develop bad breath but also more likely to have yellow teeth and you have a higher risk of developing oral cancer at some stage. If you have good dental hygiene and you do not smoke, bad breath can be linked to a lack of saliva that allows bacteria to build up in spite of your efforts to prevent it. This condition is called xerostomia, and it has many possible causes (ranging from common medications to salivary gland malfunctions). If you cannot treat the cause of a saliva deficit, you can compensate for it by talking to us about artificial saliva products that may neutralize bad breath. In around 10% of cases, bad breath will be caused by underlying health problems that are not directly linked to oral health. The main examples are infections of the throat, kidney problems and chronic digestive system problems. Sometimes, you will need the help of a doctor as well as a dentist if you want to tackle bad breath. Valentine’s Day is a special day set aside for you to show your partner how much you love and appreciate her. While there are the regular gifts like flowers, chocolate and lingerie, sometimes surprising your Valentine with a unique gift is a much-appreciated gesture of love and devotion. There’s no better way to show that you appreciate the love of your life than by taking off some pressure around the house. Many maid services offer a one-time deep cleaning service in hopes that you will become a repeat customer. If your partner is the one who does much of the cleaning up around the house, having a maid service do the chores can make the day truly special. If you’re looking for a handmade present, but you aren’t very artistic or crafty, then Etsy is one great place to check out. The site features all kinds of unique items made by resellers from around the world. Many items are one-of-a-kind and there is such a variety that there’s sure to be something that will appeal to your Valentine’s tastes. Buy a romantic book or movie. If your Valentine is a big reader, buy a romantic book to set a mood for the special day and for days to come. The book does not have to be a romance book per se, since there are many books that incorporate romantic elements in their storylines and yet are of other genres. For partners who are not big readers, find a nice romantic movie, maybe even an old flick that is nostalgic for your partner. Bookstores, gift shops and online retailers all sell magnetic word art, which can be a fun way to leave romantic messages for your partner on your fridge or other metal surface around the house. Some poetry magnets are geared at lovers, complete with heart magnets and a more romantically geared selection of words. What better way to let your lover express her love for you than with a diary? While there are many ready-made diaries for sale all over, it’s always best to leave a personal touch on one. If the diary has a plain cover, attach different fabrics, photos, artwork and other embellishments that remind you of your Valentine. Write a personal note on the first page of the diary, or even scatter little love notes throughout the pages so your partner is reminded on a regular basis of your love. Cook a meal at home. Sure, you can go out on the town for Valentine’s Day, but you’ll be out there with half the city, which can make for a less-than-intimate environment. Staying in for dinner can be a special treat, especially if you cook for a partner that usually manages the meals. Cook something you know how to prepare properly but that is also not your usual cuisine. Add in some nice decorations like rose petals on the table and play some romantic music in the background to complete the romantic ambiance. Treat your Valentine to luxury. Nothing says you appreciate your partner quite like treating him to a luxury not normally enjoyed. What luxury you choose depends on your partner’s lifestyle and needs. Maybe he really needs a new computer but has been holding back. It could be a set of sheets with a high thread count, since your partner tries to save money with more budget-friendly sheets. If it’s within your budget, you could even consider purchasing a car to replace the ailing one your partner takes to work every day. Poor Pacifier Cleaning Could Put Your Child’s Dental Health at Risk! Parenting always involves a balancing act between keeping your child happy and protecting their health. Some parents think that they have found the perfect solution in one situation, but new evidence shows that their attempts to protect their child from germs could actually be exposing the infant to harmful bacteria. The American Dental Association recently warned parents that putting a pacifier in their own mouth in an attempt to remove dirt could put children at risk of dental decay. Many parents adopt this practice because they mistakenly think that their saliva will remove germs from the pacifier, but the ADA’s verdict is that the risks far outweigh the benefits. The problem with this on-the-fly method of cleaning is that it leads to the parent’s saliva being transferred to the baby’s mouth. Saliva in an adult’s mouth is filled with a wide range of bacterial species, some of which contribute to dental decay. By putting these bacteria into their child’s mouth, parents are exposing their kids to an increased risk of cavities and other dental health problems. Even while babies and toddlers do not yet have their permanent teeth – or even any teeth at all – introducing new oral bacteria is still potentially harmful. Once bacteria have set up a colony in a baby’s mouth, they can lie in wait for the first teeth to appear. Once the teeth have come through the gums, the waste produced by the bacteria as they break down sugars starts to wear away the enamel, leading to cavities. A tooth that is badly damaged, whether it is a baby tooth or a permanent one, can be very painful. Many people suffer form bruxism, which means that they grind their teeth. However, how do you know if you’re grinding your teeth? It is extremely common to begin grinding your teeth during the night, when you have no awareness of the fact, but if you look out for the telltale signs and report them to your dentist then you will stand a good chance of being able to treat the major symptoms caused by grinding your teeth. If you have spotted chipped, cracked or flattened teeth and are confused about the cause, the explanation could be that you are grinding your teeth while you are asleep. Habitually grinding your teeth can take quite a toll on the muscles and joints in your jaw. If your face aches and it is becoming more painful to open your mouth or chew your food, you may be exhausting you jaw by grinding your teeth. There are many different causes of tooth sensitivity, ranging from gum disease to poor brushing technique. However, a fairly large number of cases of tooth sensitivity result from bruxism. If you have eliminated other possible causes of sensitivity, talk to your dentist about whether you might be grinding your teeth. If you suffer from tension headaches (i.e. headaches that hurt on both sides of your head and are located primarily around the temples), you may start to feel better if you address the possibility of grinding your teeth. If you are prone to grinding your teeth, you could also be damaging the soft tissue inside your cheeks. If you can see or feel painful areas of damage in your cheeks, bruxism is the most obvious explanation. Finally, if your partner has been alarmed by popping or grinding sounds from your side of the bed, this is an extremely obvious sign that you’re grinding your teeth. At Maple Place Dental, we’re very proud and fortunate to be members of BC’s own 123Dentist Community Dentist Network.